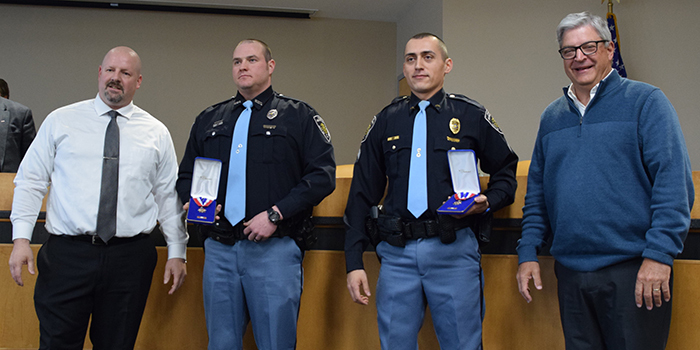 Pictured, from left, are Warsaw Police Chief Scott Whitaker, Patrol Officer Samuel Weaver, Corporal Phillip Hawks and Warsaw Mayor Joseph Thallemer. 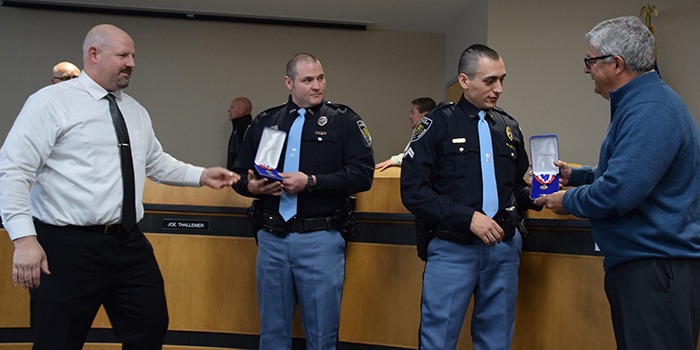 WARSAW — Two officers with the Warsaw Police Department were presented with life-saving awards during the Board of Works meeting held this morning, April 9. On May 13, 2017, Corporal Phillip Hawks responded to the scene of a female suffering from a gunshot wound 33 minutes after his shift had ended. Hawks immediately began rendering aid with the help of Patrol Officer Samuel Weaver. The two officers were able to apply pressure to the wound and a tourniquet to the victim’s arm. The officers were able to keep the victim calm in a stressful situation while continuing to gather information that led to the apprehension of the suspect. Whitaker also presented a request to seek sealed quotes for three Ford Utility SUVs. The quote includes the trade-in of seven vehicles. The department was approved to seek bids with a three percent local preference. Fast Cabs and Rock’s Yellow Cab were both approved for an additional taxi permit. Two pay applications with Mosaic Building Solutions were approved for the construction of Fire Station 3. Additional pay applications were approved for Husky Trail construction engineering, Market Street project right-of-way acquisitions and two for Wessler regarding the sewer rehabilitation. The wastewater department was approved for two right-of-way agreements with CSX Transportation and Norfolk Southern Railway regarding the upcoming sewer rehabilitation project. A change order was approved for the Fox Farm Road low head dam removal. The change included the removal of a tree necessary for access to the area. 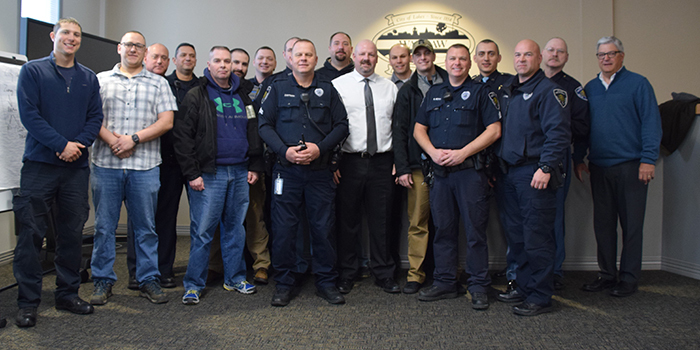 Many officers with the Warsaw Police Department came to the meeting to show their support.